Tried rice on the outside for the first time. 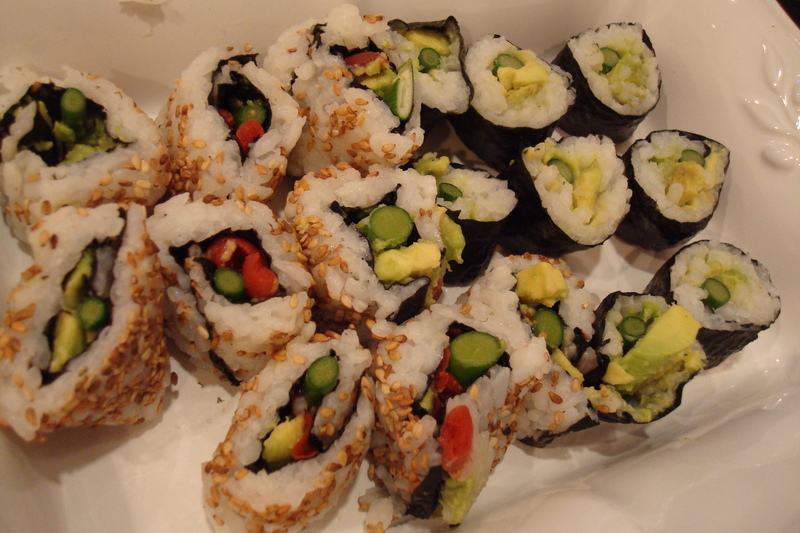 Imperfectly shaped but still delicious homemade maki rolls. Just when I start getting back my momentum, I’ve abandoned you dear readers (if you still exist!) again. My sister was visiting from ATL, and then this week I had the cheesy Food Show and mounds of end-of-term papers to still grade. Excuses, excuses, I know. After clogging my arteries with too much free cheese at the recent Seattle Cheese Festival, a light meal of raw, fresh, vegetal sushi appealed. I sprang for some nori, tiny ume plums, roasted sesame seeds and polished rice at Rice & Spice, a little Asian mart near downtown that I’m reminded of when I bike by. We had a ripe (now in season from California!) avocado at home as well as shaved ginger I pickled recently, with Linda Ziedrich’s easy recipe. And I had garlic scapes from dear Sang to use instead of scallions in the rolls. Though now I worry why hasn’t my garlic, which I dutifully sowed around Columbus Day, produced its own scapes yet? I want to make garlic scape pesto! 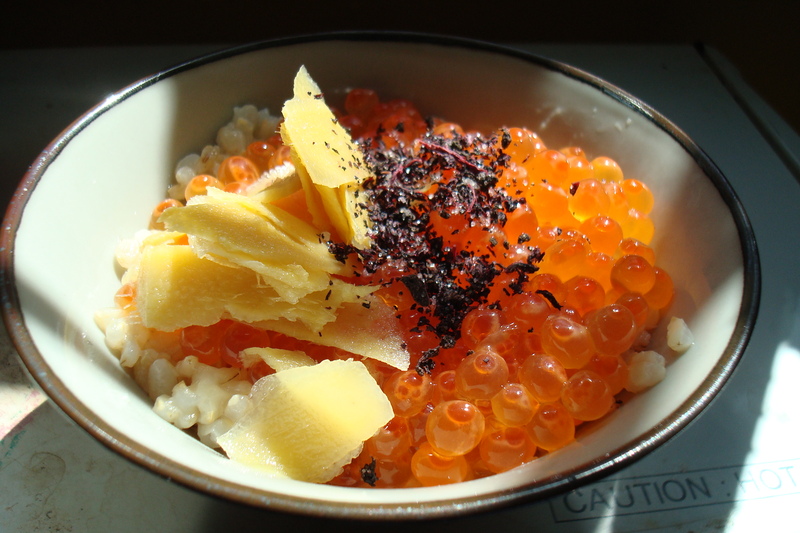 My pickled ginger over too fishy salmon roe. I bought it frozen but it is better (and less smooshed) fresh. My package of nori prodded me to try an inside-outside fancy maki roll, with rice and roasted sesame on the outside, for the first time. 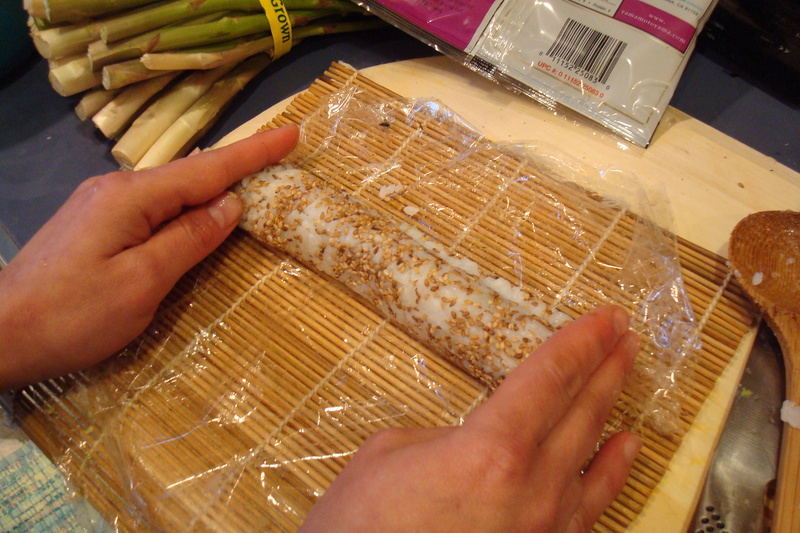 If you line your bamboo mat with plastic wrap it really isn’t any harder than a regular roll. Just really press the rice into the sheet of nori. And cut that sheet in half. I usually use the whole sheet but that makes it actually harder to roll. Cutting is always harder than rolling for me. That’s when the sushi can fall apart. It’s important to cut the rolls with a sharp knife, which sadly mine are not. Nothing like making sushi to remind a gal her knives need sharpening! How do you cook short grain rice in a pressure cooker? Your dear readers do exist, and are always glad to see your posts!